These anomalies are most likely Birkeland currents, right? So there should be a pair (or pairs of pairs) of twisting filaments moving around of differing charge. Could that induce an higher/lower gravity situation depending upon which filament you were oriented under? @ Sparky- the effects of these higher/lower shifts in gravity are negligible to people walking around, but you have to realize that Gravity has been considered a Constant Force for so long, any anomalies in it are considered reason for excitement. Does gravity make the core compact? When calculating the amount of pressure at the centre of a planet or a star, one assumes that all the gravitational mass acts towards the centre of mass i.e. the core. This is presumably the point where the pressure is increasing towards its highest amount. In a one-dimensional scenario, as in looking at the directional force vector for each mirroring particle, the middle experiences most compression. For the same reason, the liquid matter is thought to be compressed towards a compact mantle. Lets go back to considering what happens inside a spherical scenario. If one consider a tiny planetary core, and extrudes pillars of matter from that surface and up to the planetary surface, one will quickly see that the pillars only cover a fraction of the above planetary surface [below, left side]. The other way around, a planetary surface area subdivided into a grid, and columns of matter extruded inwards, these will quickly be cut off, or prioritized to reach the core [below, right side]. However, forces cancelling out, isn't neccesarily the same as zero force acting on an object. There is no reason why the centre is compact, when the pressure there appears to be zero or even outwards, and randomly distributed on the way towards the centre. As an end note, a century worth of planetary physcisists must have considered this already, so surely I must be wrong. Where is my mistake? And as a final end note: if the planetary or stellar core in fact are shown to consist of heavier elements, could the above be a good reasoning why it CAN'T be due to gravitational effects, but rather due to electromagnetic Marklund convection during the formation process? Siggy_G wrote: However, forces cancelling out, isn't neccesarily the same as zero force acting on an object. There is no reason why the centre is compact, when the pressure there appears to be zero or even outwards, and randomly distributed on the way towards the centre. That's right, that's a classic example from Physics class decades ago. If you could drill a tunnel piercing the Earth, the gravity actually decreases as you move toward the geometric center of the Earth, until it reaches zero. Take the graph that gamblix found and apply it to gas giants or the Sun. They are big balls of gas with most of the interior in microgravity. You have rocky planets like Earth rattling around inside the Sun or gas giant held in place by the magnetic fields, to be spit out when they grow too large and destabilize the internal magnetic fields. Good post and good questions, gamblix. Did you mean for the word "compact" to be a verb, meaning to compress and thereby increase the density of the core, like compressed air, or did you mean it in the sense of just making the core small, as in a compact car? If the Earth were a homogenous sphere, the greatest gravity vector occurs at the surface, and falls off radially in both directions. Toward the center, it falls off linearly; i.e., if max gravity at the surface were normalized to an acceleration of 1 (as in one gee, Earth gravity) then at half radius inward it would be 0.5 and fall to zero at the center, precisely as Siggy_G says. Moving radially zenith (away from the body)'s surface, gravity falls off (at least locally so far as we know, and neglecting other contributors to the local field, such as the Moon) in the familiar 1/r² proportion. That is at r=2, the gravity falls to 1/2² or 1/4 (of one gee), and so on, for an indeterminate but large distance. But Earth is apparently not a completely homogenous sphere, and it is slightly oblate due to the outward flexing of the equatorial regions and consequent flattening of the poles under the inertial forces of rotation. This is why the acceleration force graph of a real body would wiggle around as distance decreases from the surface to the center, depending on the mass distribution assumed or observed. For the same total mass and the same radius, the acceleration at the surface should be the same, regardless of radial nonuniformity, unless the internal mass distribution were highly off-center and off the spin axis - "lumpy", as they say in the mashed potato business. That would be like a large mass concentration ("mascon") somewhere near the surface, somewhere away from the spin axis, not necessarily covering a large area of the surface. This has the effect on the surface of raising the local gravity if you are over the mascon, and possibly skewing the direction of a gravity vector slightly off a true vertical radial if you are off to the side but relatively close to the mascon. Your plumb bob would not hang straight down, in short; you likely would be unable to tell, however, on an Earth-scale mass. The other effect of one or more mascons is to affect the rotation, just like a spinning tire that is out of balance. The spin axis may wobble more, and the center of gravity would describe its own trajectory during each rotation of the planet. The presence of mascon irregularities has been measured by satellite instruments on Earth, the Moon and Mars, yielding surface gravity intensity plots that look like contour elevation lines on a map. Your last point about Marklund Convection possibly being the organizing force of material distribution in a planet has merit, but as always, there are some questions about the assumptions that should be examined more closely (which isn't going to happen on this forum, unless I miss my bet). First, what is the assumption about how planets are formed, initially come into existence, from a pile of stuff in space, in the first place? Are they ejected from stars to decrease electrical stress "overloads", which is a popular assumption here. (I'm not being judgmental or trying to play favorites; just listing possible scenarios). Are they formed in a spinning accretion disk (proto-planetary disk or "proplid" shortly after a star has been created from a collapsing and condensing disk of matter under the consensus gravitationally-dominated scenario? Are they "captured"? The last is not really a "formation" assumptions, as a captured planet has obviously already been formed somewhere else by some assumed means. There may be other scenarios as well, like maybe a collision scenario between two bodies, but again, the two bodies had to have been formed, themselves, in the first place. In the EU paradigm, star formation involves both gravity and electrodynamics of plasma and its electric currents at different periods of the formation process. Marklund convection is highly plausible under this scenario, sorting the local constituent materials according to their ionization potentials during the initial Bennett pinching process which gathers the thin soup of the interstellar medium across a volume of space of several cubic light years and compresses it into a pinched plasmoid that evolves into an electrically fed star. Planetary nebula are construed to be one likely birthplace for this activity, in at least one of the stages of stellar construction. It would seem to follow naturally, in this chaotic, complex whirl of forces and fields and matter, that typical plasma formations as well as instabilities would occur, some of which might occur farther from the central plasmoid and some rather close. This would account for a couple of things. One is that there are "rocky" planets, and there are "gaseous" planets. A rocky planet would be one with a very thin gaseous atmosphere and a relatively large, massive liquid and/or solid core, with a gas planet being of the opposite arrangement, a thick atmosphere and a relatively small dense core. In our solar system, the majority of the significant rocky planets are closer to the star, while our four gas planets seem to have formed, or at least now exist, farther out. I'll ignore the wandering planet scenarios and just think about the formation processing here. Under Marklund convection, the heavier elements and molecules cool and tend to aggregate close to the central axis of the pinch, while the lighter, more easily ionized elements are distributed in successively wider shells around this axis, if I understand it correctly. In my own view, I suggest that there could be a fair amount of mixing going on under these circumstances. These would not be neat thin little imagined cylindrical shells with clear boundaries between the iron and the nickel, or the helium and the hydrogen, but the general scenario of ionization potential determined separations should apply under electrodynamic conditions, and later "confirmed" and further shaped and condensed as radiative cooling and gravitational processes come into play. (Put a solar system's worth of mass in a fairly small region of space, cool it down, spin it up, and certainly there will be gravitational influences on the results!) If the planets form in small regions outside the stellar envelope, they may well reflect the local conditions where one or the other constituents exist, and thus not follow the same overall distribution of elements that the star, drawing on a larger radius of separated ionized matter, consists of. This scenario also lends credence to Wal's conjecture that the interior of the Sun may not only be cool, it may consist of much heavier elements than just the H and He and a little junk created by core fusion that the Standard Model assumes. In the second EU scenario, stars, even down to dwarf size bodies, become overstressed electrically by the local "feeder" or sustaining Birkeland current, and they reflexively fission to create a greater radiating surface area. This may result in what scientists looking at Spitzer, WISE and Kepler images of potential planet candidates call "hot Jupiters", orbiting surprisingly close to their primary. Whether or not the continuing local current flow is high enough to cause either the primary or the hot Jupiter to fission yet again is something we do not know; neither has, to my knowledge, been observed in process. It's been discussed as a possibility. Whether a hot Jupiter might be created in the Markland convection differentiation process above; I couldn't speculate. But there is at least some evidence that hot Jupiters are being observed, and they seem much more likely under the EU vision than the gravitationally driven planetary formation process. If one looks at the current consensus picture of planetary formation from a big cloud of dusty material which somehow contracts under just gravitational forces, a lot of questions arise. These should include: what initiates rotation in a single ecliptic plane under gravity? What happens to the angular momentum of particles as they are drawn ever further inward toward the heating-up star? What just stops some of the infalling matter and allows it to set up a stable orbit without a net inward or outward vector component, so that it can drag around through the dusty disk and sweep up more and more matter and compress it right into its own orbital location? How are moons created and how do they get into orbit around planets? What explains the stellar jets sometimes observed in the vicinity of star formation, particularly and frequently in planetary nebulas? How long is it between the time the fusion process is said to be started under extrem,e heat and pressure conditions in the star and the time that energy reaches the stellar surface and lights up the neighborhood? etc. For me, I have found the assumptions and processes postulated to occur by the Standard Model to be less plausible than the EU model, which has a more comprehensive inclusion of all the forces likely to be in play, and gives a better model to the questions surrounding planet and star formation. Just for fun, does anybody have any idea of what would be the result of, say, an Earth-sized planet at the same distance from our Sun (same radiation and temperature environment and atmosphere) but which was all water; no core or rocky materials at all. How would the pressure vary with depth if there were no underlying hard matter? allynh wrote: That's right, that's a classic example from Physics class decades ago. If you could drill a tunnel piercing the Earth, the gravity actually decreases as you move toward the geometric center of the Earth, until it reaches zero. ... which makes me wonder how on Earth they landed on the model that the core is the most compact (most dense) derived from gravitational effects. Both based on that graph referred to and physics reasoning, the majority of matter and density would be from about r = 0.5 and towards the crust. Most of the volume is here too. (And for all we know, maybe a compact shell of matter is located at the middle of this region. Data of seismic refraction index and Earth quake waves would need to be seen in light of such a model). But at the very core, the pressure is so great that this superhot iron crystallizes into a solid. The assumption is otherwize based on the amount of rocks and material one has found in the upper crust, combined with extrapolating the rest of the mass to be below this level. Wikipedia "Structure of the Earth"
The force exerted by Earth's gravity can be used to calculate its mass, and by estimating the volume of the planet, its average density can be calculated. Astronomers can also calculate Earth's mass from its orbit and effects on nearby planetary bodies. Observations of rocks, bodies of water and atmosphere allow estimation of the mass, volume and density of rocks to a certain depth, so the remaining mass must be in the deeper layers. But that doesn't mean the core is the most compact region. It may be so, but in that case, it is certainly not due to gravity. However, Marklund convection shows that heavier elements condense towards the centre of a current column. y taking more than 70 million observations during its first 2 years in orbit, a limousine-length satellite has given scientists their most detailed map yet of Earth's gravitational field. The lumpiness of that geoid—the theoretical surface that a planet-wide ocean would take if there were no tides or currents—betrays the irregularity of the planet's mass distribution, including concentrations of mass such as mountain ranges and ice sheets. Yellows and reds mark areas of higher-than-normal gravitational strength; blue shades are lower than normal. Interesting antipodal gravity 'wells' at at Sri Lanka and Carribean basin. No problem, Siggy! That happens to me a lot, too. Besides, your post is nice and short, and a lot easier to read than mine. * Allyn found a good website some time back suggesting that seismic waves indicate that the Earth is hollow, and it sounded correct to me. I don't feel like looking up the link right now. I guess the hollow area might be up to 1,000 miles or so in diameter, or maybe just a few hundred miles. The hollow would surely not be a vacuum, but air, possibly under pressure. Some geodes have liquid under pressure, but I don't think the seismic waves show evidence of a liquid center. I suppose a liquid planet could also be hollow, but the hollow would probably be smaller. I'm saying it may be hollow because of the supposition that gravitation would be zero at the center. A rapidly spinning liquid planet might have a larger hollow center. * But I've actually read a theory somewhere that gravity is mainly a surface phenomenon. I've also read evidence lately, by Stavros Tassos, that the Earth's interior is fairly cool, rather than hot. I believe he said the evidence suggests that Earth's outer core is hot liquid iron, but it's mostly cool above that, according to seismic wave velocities, except near the surface along the Pacific ring of fire etc. If he's right, then much of Earth's interior could be habitable, though it would probably have to be excavated first. Lloyd, the old Hollow Earth link seems to be broken, but I found a copy here. seasmith, the gravity mapping link is devastating. Sadly, I have to discuss it down in the Are the planets growing? thread, once I get over the shock. ...At first glance it looks like a potato-shaped asteroid flying through space. 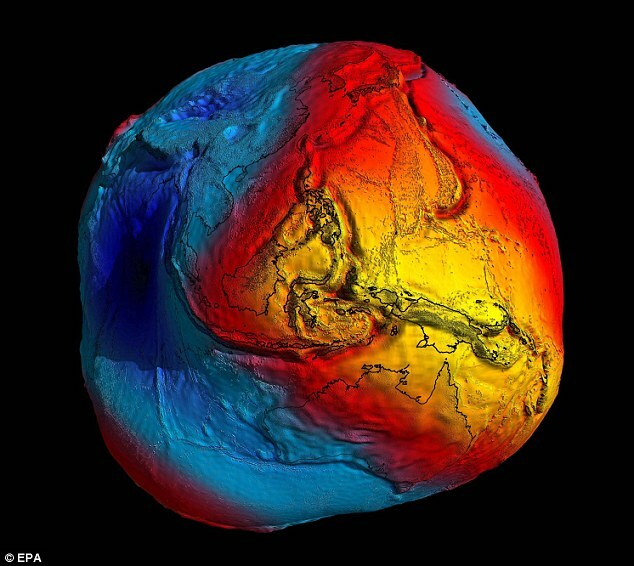 But this multi-coloured image is actually the Earth - and shows how gravity varies on different parts of the globe. The images were unveiled today by the team behind the GOCE satellite at a conference in Munich and are the most accurate ever released. Areas of higher gravity seem to be along 'fault' lines or 'tectonic plate' boundaries. Higher gravity area over Antarctica as well. Perhaps this is indicative that Einstein should not have used gravity as a constant in this formulas? Would that not open the door to the concept that gravity is indeed related to charge, and that these areas of 'higher' gravity are zone wherein the Earth's charge is greater than elsewhere? I think this is TPOD material! With due respect, there we go multiplying the thread count again, making it harder for the mods. Couldn't we just discuss the Gravity Map in the previous thread where it was introduced ? Or maybe start a consolidated Gravity thread for the Planetary Science drawer ?